Yet another article, that doesn't even make an effort to answer the hard questions, but just propagates ICO bubbles. "Entrepreneurs seeking capital to build tech startups have long sought out elite venture capitalists on the famed Sand Hill Road in Silicon Valley. Now the many startups developing applications for blockchain technology have another option: They can go online and raise millions by creating digital tokens, for use as currency on blockchain platforms, and selling them in what is known as an initial coin offering, or ICO." Who are participating in these ICOs? the same people who could participant in a VC round or retail investors? If it is retail investors, how are ICOs fixing the information asymmetry and risk problems associated with an early stage asset? "For instance, Protocol Labs Inc., based in San Francisco, which recently raised $253 million in an ICO, is building a network with blockchain technology on which digital storage can be bought and sold using the Filecoin tokens it sold in the offering. Protocol isn’t selling storage space; it’s building a market where people can buy and sell storage space." So, what are coin owners getting? Free access to storage space later? i.e. pre buying what will become a costly asset? But will storage stage actually become a more valuable asset? What's the basis? Same questions can be raised for Golem factory example. "The tokens can be bought and sold after an ICO by investors. If a company’s platform is a success, the value of its tokens should increase because there will be greater demand for them." Why? As in why should the value of the tokens increase even if the company is a success? Additionally, most companies make revenues & profits in many different forms - so owning shares in the company always worked, because you got a share of all profits, made in any manner. ICOs effectively take away that inclusiveness. "Doing an ICO doesn’t preclude a company from also raising money through equity offerings. But some startups are switching entirely away from equity funding, says Spencer Bogart, managing director and head of research at Blockchain Capital, a venture-capital fund that both invests in ICOs and makes traditional equity investments in startups. “You can raise a venture round or raise 10 times as much with an ICO and give up no control,” he says." Right, because as an investor, I love the idea of investing in assets that have scant connection to asset's profitability and I don't need any control to prevent misuse by the founders. "Whatever the risk, some investors say it may be worth it. 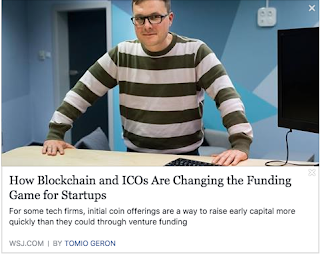 That’s because the companies selling coins in ICOs are aiming to develop technologies that could be fundamental to entire industries, as, say, email or file storage or computing power are today." Oh come on, why would using ICOs make it any more likely that the founders would solve "fundamental problems". If someone tells me file storage marketplace is a fundamental problem, then I want to smoke the same weed they are. Between May & August of 2016, I sold 28 different scrips from my portfolio and exchanged all of them for 1 ETF - JUNIORBEES that tracks the Junior Nifty index. Last week, I sold all my JUNIORBEES position. One reason was that it was hitting an all time high. The second was that my holding period exceeded one year, switching me to long term capital gains bracket. The table lists the differences strictly on price, any fees and brokerage paid for the switch has not been deducted. Intra-day changes might also place a minor variation in the comparisons as the the actual sale price of the LHS is based on the price I actually sold at while the potential is based on closing price on the day I sold JUNIORBEES. The RHS is strictly based on the actual prices I traded on. The variations and brokerage put together should not factor for more than 2%, IMHO, hence not being material for this calculation.